I have always wanted a treehouse. Wouldn’t it make a great writing studio? I had so much fun reading this, I read it in one afternoon (on my deck, since I don’t have a treehouse, but I could pretend). Winnie’s last day of fourth grade ended with a pretty life-changing surprise. That was the day Winnie’s parents got divorced and decided that Winnie would live three days a week with each of them and spend Wednesdays by herself in a treehouse between their houses, to divide her time perfectly evenly. It was the day Winnie’s seed of frustration with her parents was planted, a seed that grew until it felt like it was as big as a tree itself. 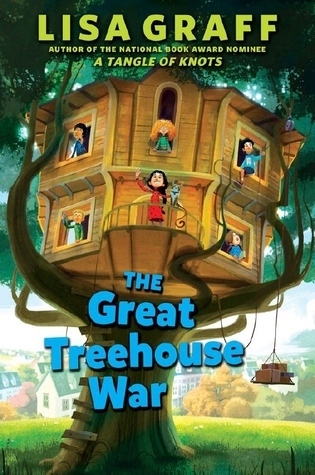 The Great Treehouse War by Lisa Graff was published by Philomel Books, an imprint of Penguin Random House, in 2017. Although the situation with Winnie’s parents and their exact schedules seemed pretty extreme, I think many kids will relate to feeling caught between two parents who aren’t getting along. And when the solution is making up your own rules and living in a treehouse – this whole scenario makes this book so much fun! I really enjoyed the different personalities of Winne’s friends, and her cat, Buttons, but Winnie’s character and her predicament was what kept me reading to see how she would deal with her parents arguing (and not fail fifth grade!). This book also has lots of fun ‘sticky notes’ with comments from Winnie’s friends as well as ‘how-to’ instructions for different projects (e.g., making friendship bracelets). It was really interesting to see how Lisa Graff incorporated all of Winnie’s ten friends, her parents, her uncle, her teacher and her cat into the storyline. That’s a lot of characters to worry about! The ‘sticky note’ comments help to reveal more of her friends’ personalities. A lot of humor in this story is created through the strategy of exaggeration and it’s very effective in making the story fun even though the underlying problem of feeling torn between divorced parents is a serious one. This would be a great book to start discussions or projects about government and how countries are run. This might be interesting to read along with the picture books, Roxaboxen by Alice McLerran & Barbara Cooney (HarperCollins, 2004), and How to Build Your Own Country by Valerie Wyatt & Fred Rix (Kids Can Press, 2009). I might encourage students to work in a group to create their own country, drawing designs and making up rules. Lisa Graff is the author of several other middle grade books, such as A Tangle of Knots, A Clatter of Jars, Absolutely Almost and Double Dog Dare, among others. *In case you're wondering why you haven't seen any middle grade book reviews from me for a while, I've had several life-changing events happening in my life and it has been hard to find time to read any books at all. I'm excited and hopeful that I will catch up on my reading and writing this summer! I agree that a lot of kids would relate to the splitting of time between parents issues. And this sounds like a great learning experience on how to make so many characters unique. Glad you enjoyed this. I almost picked up this book at the store yesterday. I just had a gut feeling it was going to be amazing. Should have listened to my gut. Thanks for the review. I have this on my list of books to read this summer. Your review made me want to move it to the top. The theme of divorce has never been handled in this way. Can't wait to read! I really want to read this book after reading your wonderful review. Clever idea to have Winnie take charge. I agree with Greg's comments -- I haven't seen divorce handled this way. This is certainly a topic lots of kids are dealing with. Thanks for the review.